Bicyclists who ride the roads of the Snoqualmie Valley undoubtedly know this location. After taking the photo, I got curious about this robin-egg blue barn and tried to find out something more. The King County Historic and Scenic Corridors Project tells us that this distinctive bow-arched blue hay barn and matching early milk house are part of the historic Vandermeer-Sinnema Dairy Farm. It sits on West Snoqualmie Valley Road, which started as a rough trace built piecemeal along the hillside over-looking the valley in the 1870s. It’s near the intersection of Northeast 80th Street, aka Vincent Flat Road. The name Vincent comes from the name of an old community that existed here. You can’t even find the name on maps anymore. A post office opened here in 1894, but closed just five years later. 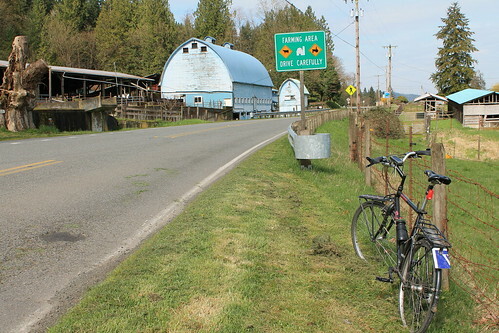 I came across this scene on Tuesday as I was out mapping some bike routes through the Snoqualmie Valley near Carnation. I stopped to take the photo, turned around, and spotted this old schoolhouse. 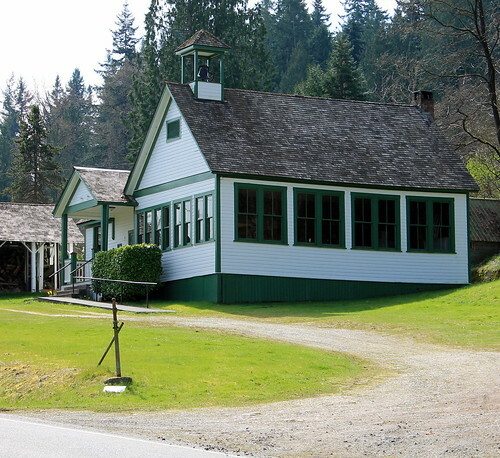 That’s the old Vincent Schoolhouse, built in 1905. Amazing that it still exists today. HistoryLink.org says it was built by the local families and that teachers were hired for 3-month stints to teach all the grades. About 20 children attended the school at any one time. It closed in 1947 and was later named a King County Landmark. Kind of an interesting slice of history for an intersection of two roads that I usually just whiff past on my bicycle. Just want to thank you for your inquisitive, historical bent and the willingness to share. The information is, as you say, “an interesting slice of history” about an area I ride on occassion and knew little about. Thanks, my next ride through that area will be more meaningful and appreciative as a result of knowing just a little more about it.